Join the Minion madness and get ready for Despicable Me 3 with this Bop It! Minion game. It works just like the classic Bop It! 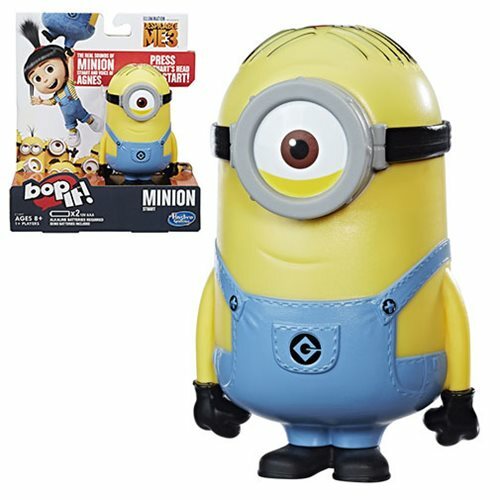 game but now the game unit is in the image of an adorable Minion, as seen in the popular Despicable Me movies! So get ready to pull it, twist it, and bop it Minion style. The game commands are in the voice of Gru, and get faster the longer you play, challenging you to respond as fast as you can to stay in the game. Great for playing solo, or for quick pass and play action. Requires 2x "AAA" batteries, demo batteries included. Ages 8 and up.